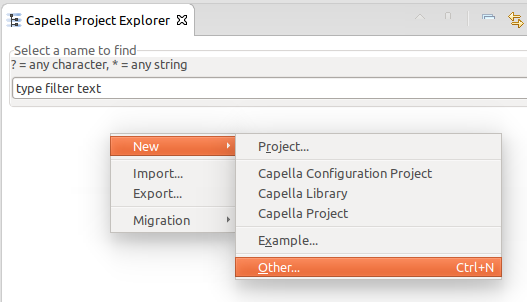 Following you will find the tutorial to use M2Doc document generation with Capella. 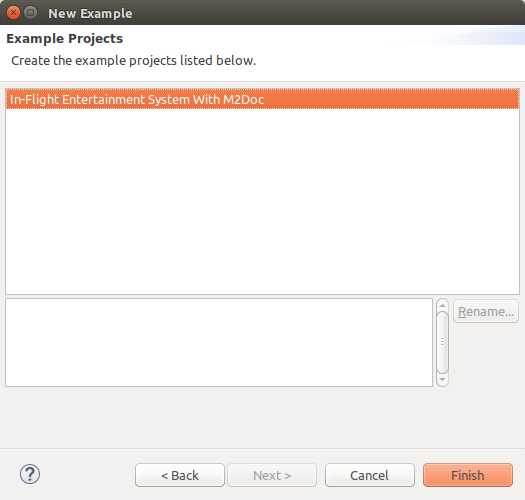 This will cover installation of integration plugins and deployement of the In-Flight Entertainment System (IFE) example. Before you start you can have a look at the LA template and the SA template and the generated LA document and SA document. More information about the templates here. 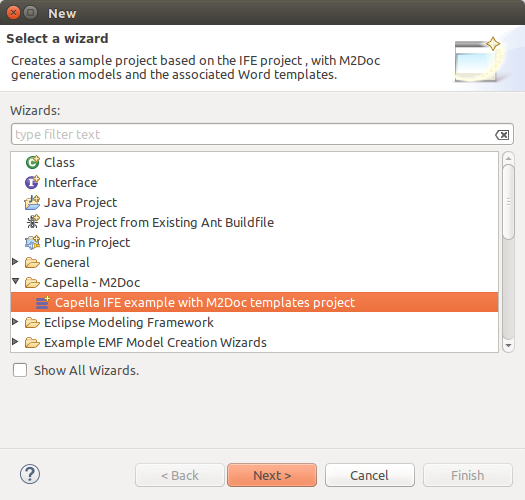 Note: M2Doc 1.1.0 and above are compatible with Team for Capella. You can test the generation by sharing the IFE example project provided in the extensions. 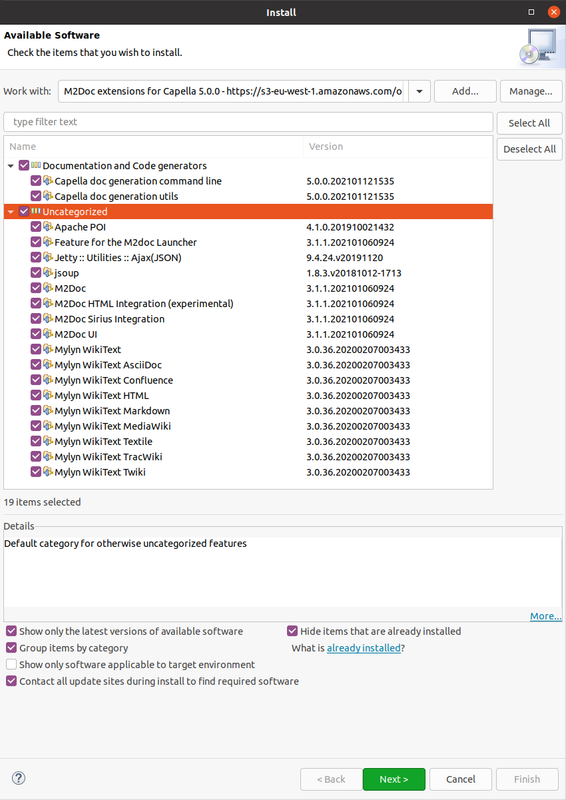 Then edit the .genconf file to reference the shared SystemEngineering model element. You might need to open the Capella session first by double clicking the .aird file. First you need to download Capella. It can be downloaded from this download page. Use the New > Other menu. 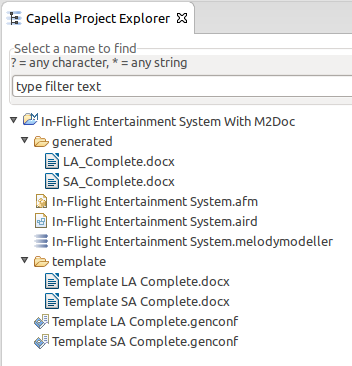 The select the Capella - M2Doc > Capella IFE example with M2Doc templates project. Click the finish button and you should see the following project in your workspace. You can run templates by using the corresponding .genconf file at the root of the project, to do so use the .genconf file as shown here. Templates are located in the template sub folder of the project. If you want to go further in template editing you should have a look at the M2Doc documentation. In the following you will find a description of each templates. This template allows the generation of a logical specification of the content of the system. It starts by a description of the hierarchy of logical components, with, for each, its allocated functions and provided/required interfaces. Then the function decomposition is presented including functional exchanges. At the end, a reference of data structures is generated. You can have a look at the LA template and the generated LA document. This template allows the generation of a document concerning the whole specification of a system. Starting from mission and capabilities of the system, the template presents the context of the system, its state machines and communicating actors, and functional specifications. At the end a reference of data structures is generated.You can have a look at the SA template and the generated SA document.